West Mercia Police, formerly known as West Mercia Constabulary, is the territorial police force responsible for policing the counties of Herefordshire, Shropshire (including Telford and Wrekin) and Worcestershire in England. The force area covers 2,868 square miles (7,430 km2) making it the fourth largest police area in England and Wales. The resident population of the area is 1.19 million. Its name comes from the ancient kingdom of Mercia. The force is divided into five divisions and represent a very wide spread of policing environments from densely populated urban conurbations on the edge of Birmingham as well as Telford, Shrewsbury, and Worcester, to sparsely populated rural areas found in the rest of the force area. As of September 2017, the force has a workforce of 2,017 police officers, 223 police community support officers, 1541 police staff and 388 members of the special constabulary. 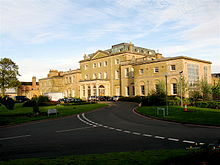 The force has its headquarters in the historical manor house and grounds of Hindlip Hall on the outskirts of Worcester. Its badge combines the heraldry of Worcestershire, Herefordshire and Shropshire. West Mercia Police has two control rooms, one in the headquarters in Hindlip and a North control room in Battlefield, Shrewsbury. The force was formed on 1 October 1967, by the merger of the Worcestershire Constabulary, Herefordshire Constabulary, Shropshire Constabulary and Worcester City Police. It lost territory to West Midlands Police when that was constituted on 1 April 1974. It changed its name from "West Mercia Constabulary" to "West Mercia Police" on 5 May 2009. West Mercia was a partner, alongside two other forces, in the Central Motorway Police Group. On 8 April 2018 West Mercia withdrew from the CPMG, with the 25 West Mercia police officers attached to the group returning to the in-force roads policing service. In 2013 an alliance was formed with Warwickshire Police. In October 2018, West Mercia Police announced that they would be withdrawing from the alliance. Paul West, QPM, who retired as chief constable on 31 July 2011 was the longest serving chief constable in the force's history. He was succeeded by his deputy chief constable, David Shaw, who took up the senior post on 1 August 2011. Anthony Bangham became Chief Constable in August 2016. The force is organised into five territorial policing units (TPUs) which are alphabetically coded geographically from south to north (C D E F & G). Operating across three counties, West Mercia Police maintains many stations, with each TPU having an HQ Police station. The TPUs are further divided into Safer Neighbourhood Teams (SNTs); there are 82 SNTs across the force. Some areas of Shropshire are covered by Telford and Hereford officers. A volunteer cadet scheme had existed in the Telford division since the early 1990s and in September 2013, the scheme was expanded force-wide, creating a new detachment of police cadets in each Territorial Policing Unit area. Each detachment is headquartered in the respective TPU HQ, except the South Worcestershire detachment, which is based at Tudor Grange Academy. In 2010, the Telford Cadets Detachment was awarded The Queen's Award for Voluntary Service. According to West Mercia Police's website, "The scheme is aimed at young people who wish to engage in a program that offers them an opportunity to gain a practical understanding of policing, develop their spirit of adventure and good citizenship, while supporting their local policing priorities through volunteering, working with partner agencies and positive participation in their communities." A new intake of approximately 15 new cadets per detachment occurs annually. New recruits must be aged 16 or over and have finished secondary education. Young people can remain as cadets for up to two years. Cadets can then consider joining the force at age 18, becoming a cadet leader in their detachment, or leaving the scheme altogether. Each detachment is led by several cadet leaders who are police officers, PCSOs and police volunteers from the force. In November 2005, the government announced major reforms of policing in England and Wales, which raised the prospect of West Mercia Constabulary being merged with other forces in the West Midlands region. Under final proposals made by the Home Secretary on 6 February 2006, it would merge with Staffordshire Police, Warwickshire Constabulary and West Midlands Police to form a single strategic force for the West Midlands region. This came under particular criticism from West Mercia Constabulary, especially as it was rated the best force in the country. Instead, the constabulary wished to remain a separate force. The proposals were also unpopular with many of the local authorities in the West Mercia area. When Labour's John Reid became Home Secretary in 2006, he put plans to merge the forces on hold. The subsequent coalition and Conservative governments have not made any indication of re-introducing such plans. In 2013 the West Mercia and Warwickshire police forces formed an alliance, sharing certain administrative functions in order to save both forces money. In October 2018 West Mercia Police announced its intention to withdraw from the strategic alliance with Warwickshire Police. Policing Shropshire 1836–1967 by Douglas J. Elliott. Contains black and white plates, including illustration of badges as a frontispiece. Shropshire Police was amalgamated into the larger West Mercia Constabulary in 1967. ^ a b c d e f g "The West Mercia Environment | Joint Policing Plan 2010–13 | Our Publications | About Us". Westmercia.police.uk. Retrieved 6 November 2014. ^ "West Mercia Police Authority". West Mercia Police Authority. 16 November 2012. Retrieved 15 October 2013. ^ "West Mercia Police - Changes to local policing to offer improved protection for communities". www.westmercia.police.uk. Retrieved 27 May 2018. ^ "Police forces to scrap alliance". BBC News. 9 October 2018. Retrieved 11 October 2018. ^ "Knights Bachelor". The London Gazette (Supplement). No. 45117. 5 June 1970. p. 6366. ^ "Fascinating story of life as a police officer". Droitwich Spa Advertiser. Retrieved 23 June 2018. ^ "Tributes paid after death of ex-chief constable who 'turned West Mercia Police around'". Shropshire Star. Retrieved 23 June 2018. ^ "REPORT OF THE MEETING OF WEST MERCIA POLICE AUTHORITY HELD ON 21 SEPTEMBER 2004" (PDF). West Mercia Police. Retrieved 23 June 2018. 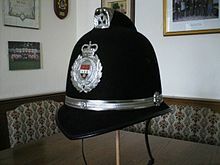 ^ a b "Chief and Deputy Chief Constables 1990 to 2010". West Mercia Police. Retrieved 23 June 2018. ^ "New Chief Constable Appointed To Succeed Paul West". West Mercia Police. Retrieved 16 October 2013. ^ "Chief Constable Anthony Bangham - Biography". West Mercia Police. Retrieved 27 May 2018. "Police merger plans are unveiled". BBC News. 22 December 2005. Retrieved 2 December 2005. "Police mergers outlined by Clarke". BBC News. 6 February 2006. Retrieved 6 February 2006. "Concern as police merger dropped". BBC News. 12 July 2006. Retrieved 12 July 2006. This page was last edited on 12 March 2019, at 21:17 (UTC).